More than ever businesses can leverage the power of sophisticated tools and technologies to provide self-service opportunities to customers to get the information they need. However just because they can, doesn’t mean they should! The urge to force self-service options onto customers should be a carefully considered decision as getting it wrong can have an adverse impact on customer experience. If you do proceed, like with any change and especially in the early stages, the focus should be on improving the quality of the self-service channels by continuously seeking feedback and making improvements. Of course, self-service options are typically focussed on resolving the more ‘simple’ enquiries and human contact will (and should) be easily accessible to enable the resolution of more complicated issues. Below I’ve outlined seven powerful self-service channels available to businesses today. A powerful self-service channel, best used to provide quick information to customers like account balances, outstanding amounts, location, confirmations etc. It can also be used to play customised messages to clients that add value. Risks are using an IVR tree with too many options and playing generic messages that may not be useful to all customers leading to customer frustration. Find local providers of IVR Solutions. A well-developed Knowledge Management Platform that is searchable with good quality content can reduce response times significantly leading to customer and employee satisfaction. If a customer can resolve their issue or get the info they are after from KB articles then it can significantly reduce support costs. These costs can be utilised for regular high-quality training for staff to resolve more complicated issues that require human intervention. Another bonus is that customers who are able to resolve an issue themselves via self-service typically rate their satisfaction with your business higher than having to make contact directly with a support person. Risks are creating KB articles that are not clear and incomplete which means the customer has to call support anyway – this can often lead to high frustration for the customer and also has a direct impact on your costs. This is another great self-service channel that is interactive and drives customer engagement. The goal should be to develop a community of customers who can help each other like a crowdsourcing model. Risks are not responding quickly to customer queries and not providing a solution as these discussions can get detailed and complicated. Your subject matter experts should be managing forums. Bots are the most recent development in the area of self-service. They are interactive and can be programmed to understand and respond to simple tasks. Bots can significantly reduce support costs by managing all simple tasks and they are available 24×7. With the exponential progress in machine learning and AI, bots could end up managing moderately complicated tasks. Risks are poorly developed bots that can not provide the right information to customers leading to a bad customer experience. It is always a good idea to give the opportunity for a customer to move from a bot to a staff member as and when they want to. Find Chatbots and Virtual Assistant providers in our directory. Blogs are a great way to educate customers about a particular topic with good engaging content that adds value. It drives customer engagement and develops an affinity with your brand. Imagine your blog popping up in google results in response to a customer search. It raises customers confidence and makes them explore more about your business. This is way cooler than FAQs and the question mark (?) in products. It only applies to software products where the customer is guided depending on previous actions/inputs in the product. In simple terms, it can be MS Excel recommending a chart based on input data or an interactive game teaching a player on how to deal with a certain situation. Over 300 hours of video content is uploaded to YouTube every single minute and over 5 Billion videos are watched on Youtube every single day. 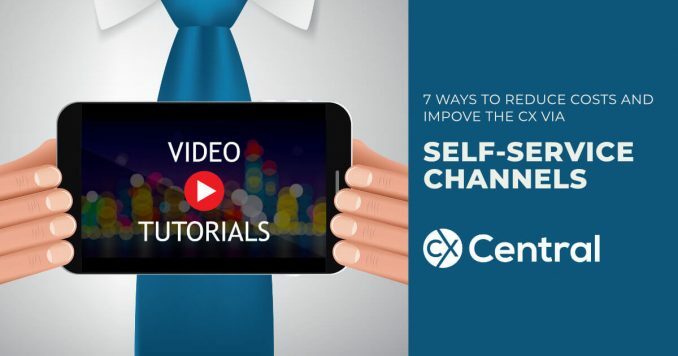 Being able to visually communicate to your customers via video is a great way to show how-to videos, fix-it videos etc making it one of the most powerful self-service channels available today. In summary, self-help channels that are well designed can not only improve customer experience but can reduce service costs as well. The key is to invest in continuously improving these channels based on customer preferences and behaviours. Find solutions to help improve your self-service options from technology suppliers, consultants and more in our Business Directory.